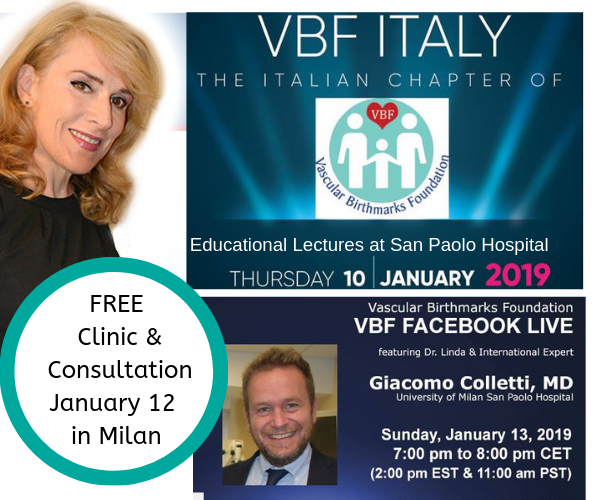 Dr. Linda and VBF’s newest International Vascular Anomalies Expert, Dr. Giacomo Colletti, will be hosting a FREE informal clinic/consultation on Saturday January 12th in Milan, Italy. The consultations will be held at the Studio Colletti, piazza della repubblica 1/a, Milan. Third Floor. Appointments are available from 10am – 3pm. Email Dr. Linda at vbfpresident@gmail.com if you are interested in attending the free clinic/consultation and remember to attach a photo of the vascular birthmark/anomaly/malformation. This is an awesome opportunity for our families in Europe who are normally not able to consult with a VBF expert, in person, for free.